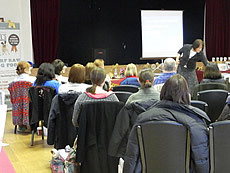 Demand for the Seminar was remarkable and ticket sales had to be restricted a week before the event. The WHI Organising Group express thanks to those who participated and braved the expectation of snow on their homeward journey. WHI also extends thanks to the Speakers for a wonderful mix of information and education. .."Just wanted to say a big thank you to everyone for organising a fantastic seminar today. Hope everyone got back home Ok."
.."excellent day, the importance of learning from each other and being honest if there is a problem produced. Thanks to all for the huge amount of work that it must have taken to bring this together". .."Was so interesting and educational. Both speakers delivered their 'presentations' brilliantly, easy to listen to and easy to learn I really came a way feeling it was very worthwhile. The food was great too. Well done WHI Team ....you did a great job putting the day together". 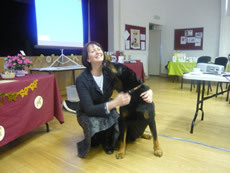 .."I was at the presentation and was very impressed with Gwen's knowledge and commonsense approach to socialising pups". .."I was very lucky to win the bottle of whisky signed by ex wheaten owner and boxer Barry McGuigan, I am now finding a safe hiding place so it does not get opened in error". "Thanks to all for a well run informative day. Hope everyone got home safely. As always the catering from Pam & John was superb and my family say thanks for their tea as I had no intention of cooking tonight!! 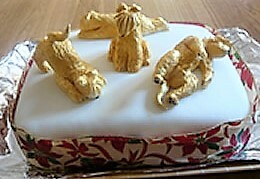 The dogs were also very pleased with the wonderful biscuits from Daisy's Dog Deli. It was good to be able to hear two knowledgeable speakers and once again the message they gave was "education, education, education" I am sure that we all learnt from their presentations". "I don't think you can do any better. Congratulations to you all & your hard work. Organisation superb, food superb, handouts superb. Well done. What a lucky breed we are to have you guys!!" .."all who organised and participated deserve a pat on the back and I expect will have a good nights sleep for the first time in a week and not be weather forecast watching!" 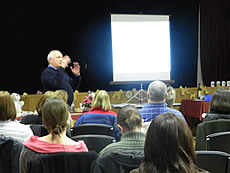 "It really was a well organised and informative seminar. Well done to everyone involved in organising and running the event". It may have taken me quite a while to get home last night (four and a half hours) and the journey back was interesting to say the least, but I felt it was well worth the trip down". "Many thanks to all the steering group of WHI and all those who helped to make this another great event, you can feel proud of yourselves. A special mention must go to Mr. & Mrs. Busy in the Kitchen, Pam & John who never fail to put on a fabulous spread, and not forgetting the WHI Birthday Cake, plus the beautiful golden Wheatens on top made by Lynn Carter to celebrate 9 years since its inauguration in February 2003". "Thank you all for the appreciation expressed to us by so many people and the help both offered and delivered. The gift which was so thoughtfully chosen will, I am sure, be a fabulous reminder of the day. Pam, John, Buzz and Noo Noo"
"Congratulations to you all for an absolutely brilliant day again and enjoyed by all! You can now have a well earned rest after almost a year's work in organising this event, if that is possible!! 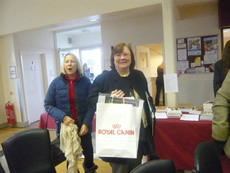 It all looked fabulous when we walked in with everything set out and tables ready for lunch - such organisation!" .."one complaint - it wasn't long enough!" "Thank you and well done for yesterday it was really amazing. Both speakers were excellent". 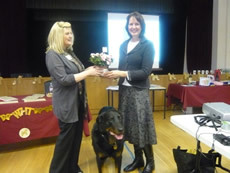 .."thoroughly enjoyed the event and felt very welcome. We had a lovely day good friends to see and informative speakers. Food fab as always". .."I found everyone very friendly yesterday and thought the event was well run and enjoyable"
"Please can you keep me in touch for future dates. And thanks, Saturday was great". "Thank you for an enjoyable day. Speakers and hospitality excellent!" Puppy School Puppy Advice for information relating to her talk, particularly the two puppy socialisation videos. 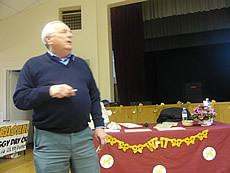 Dr Sampson talked about Canine Genetics and the Kennel Club's Mate Select system. Go to our Genetics pages for further information.